The electrification of the Glasgow-Edinburgh line will make substantial rolling stock available in Scotland from 2017 – some of which can be used on the new line. Scotland has 1,700 miles of railway line so the addition of 5+ miles to reconnect Leven with the main network at Thornton should not be huge step, nor the addition of 2 `new’ stations (at Leven and Windygates/Cameron Bridge) to the 351 stations already open across the country. The extension of hourly journeys linking Leven to Edinburgh (with connections north also) would not even add to the 2,500 rail services operating daily across the country. In terms of investment required, the estimated £55 million pricetag required to reinstate this line pales into mere insignificance against the context of the £5billion spend by Network Rail in its current 5 year plan, and a mere fraction of the £300 million presently being spent on the Border rail link. So why not?, and why not soon? 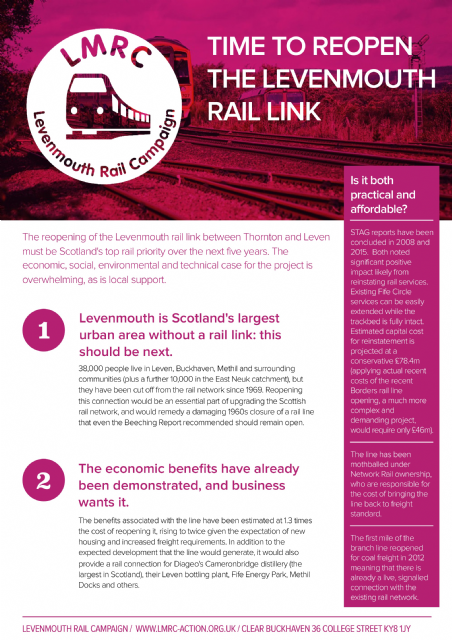 The £650 million now being spent on Edinburgh-Glasgow line electrification will even release the engines and carriages needed to support services on the Leven branchline extension – so no additional cost there. To protect the environment and improve health.